Image caption National Museum of Ireland experts have dated the rings between 1200 and 800BC. 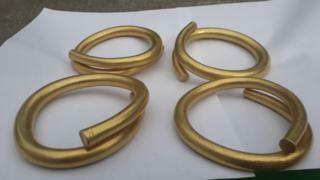 Four late Bronze Age gold rings discovered by a farmer in County Donegal are to go on public display. Known as the Tullydonnell hoard, they were unearthed by Norman Witherow in June when digging in a field near Convoy. Experts at the National Museum of Ireland, where the rings will go on display, date the find between 1200 and 800BC. Maeve Sikora of the museum said the rings are in "perfect condition." Museum staff had conducted extensive analysis of the gold but their purpose remains unclear, Ms Sikora, the museum's keeper of Irish antiquities said: "They've been described as 'arm bands' because of their size, but it is thought more likely that gold was shaped in this fashion as a means to store wealth." Weighing just over 4kg (8.8lbs), the Tullydonnell rings are among the heaviest gold hoard ever discovered in Ireland. They will go on show on Wednesday alongside the museum's permanent gold exhibition, Ór - Ireland's Gold. It is regarded as one of the largest and most significant collections of Bronze Age gold internationally. Image caption The Tullydonnell hoard was found by farmer Norman Witherow earlier this year when he was digging in a field near the town of Convoy. Next year the gold will go on temporary loan to the Donegal County Museum. Judith McCarthy, the museum's curator, described the hoard as a unique and significant find. "Donegal has a very rich and varied history stretching back thousands of years and the Tullydonnell hoard forms an important part of this multi-faceted story," she said. Ireland's Minister for Education and Skills, Joe McHugh will launch the exhibition with the hoard's finders on Wednesday. He said: "I never knew Donegal was considered to be a particularly active area during the Bronze Age." "This discovery is so exciting for Donegal because it gives us a rare and important insight into the history of our county, and it's equally important for Ireland in that it adds to our already extensive collection of artefacts from this fascinating era," he added.